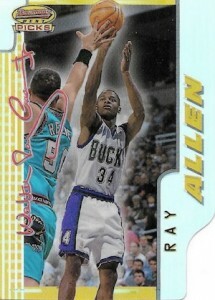 While it was not the only chromium basketball product in 1996-97, the loud design and Atomic Refractors help distinguish 1996-97 Bowman's Best Basketball. 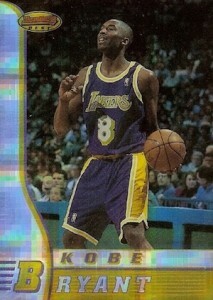 Like all products from the season, the deep rookie class led by Kobe Bryant adds considerable interest and value. The full base set for 96-97 Bowman's Best includes 125 total cards, but it can be broken down into three different subsets. The first 80 cards make up the traditional base set. The can be easily identified based on the gold background. Numbered separately with an "R" prefix, 25 rookie players are highlighted next. 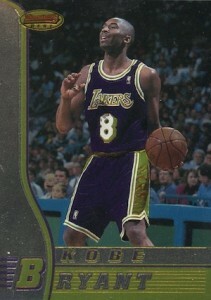 While the design is the same, the gold background and silver highlight is flipped so that the primary color is silver. 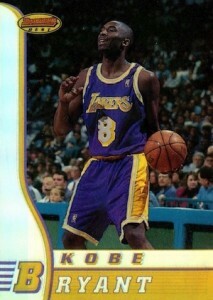 Key rookies include Kobe Bryant, Allen Iverson, Steve Nash and Ray Allen. Finally, the Retro subset adds 20 more cards. 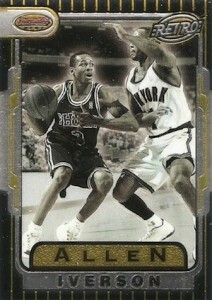 Numbered with a "TB" prefix, the cards showcase a black-and-white image. 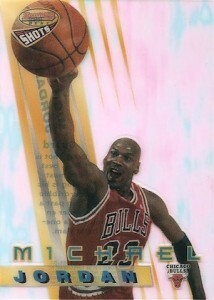 The key to 1996-97 Bowman's Best Basketball for most collectors is the Refractor parallels. All base cards and inserts feature both a base Refractor and Atomic Refractor. The Atomic Refractors are particularly eye-catching thanks to their unique design. While they first made their debut in the baseball edition of the product, these are the earliest Atomic Refractors for NBA collectors. Dropping a few per box, several inserts are also available in the bold set. Best Cuts and Best Picks are very similar and both feature a die-cut design and facsimile signature. Honor Roll pairs two players on the same card. Along with Honor Roll, the three largely follow along with the base design. The sole standout in the release is the Best Shots insert. 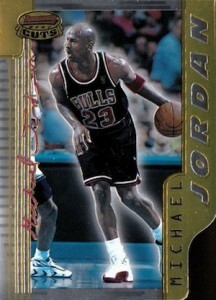 The cards feature an acetate stock and seem largely disconnected from the brand. 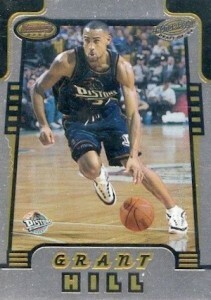 Yielding 24 packs of six 6 cards, sealed 1996-97 Bowman's Best Basketball boxes have become tougher to track down over the years. Prices hover in the $250-300 range. 125 cards. Shop for complete sets.